Katy's color scheme included bright, saturated shades of orange, purple, and green to complement their October wedding. The orange was a perfect match to the bridesmaids' dresses. Orange roses, green Echeveria succulents, hydrangea in several shades of purple, stephanotis with orange centers, purple berries. Stem wrap of pale mocha-colored vintage lace. Orange hydrangea, purple berries, green Echeveria; twine accent. Same flower assortment as bridal bouquet, but with the hydrangea & rose colors swapped to make purple the dominant color. Green echeveria and purple berries; twine accent. 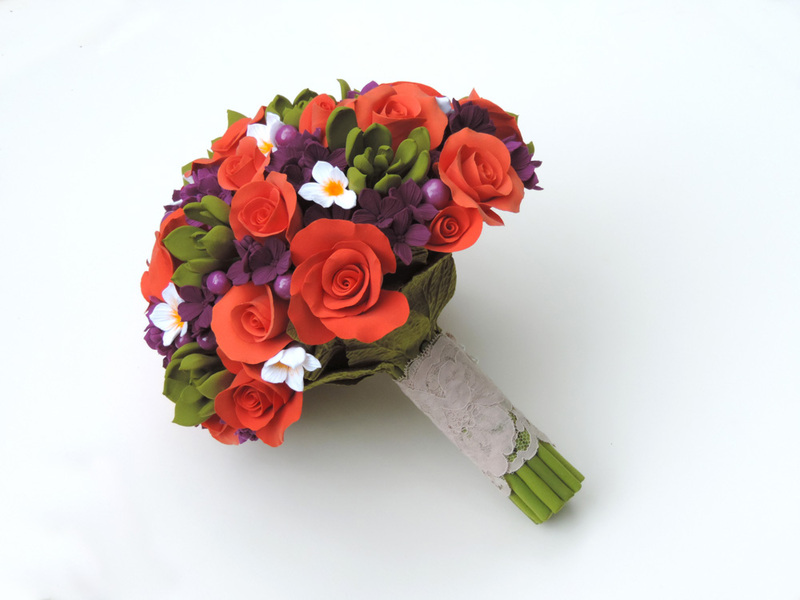 Matching corsage & boutonniere for each set of parents; roses, hydrangea, berries, stephanotis. Ring bearer's Gerbera daisy boutonniere and flower girl's matching convertible hair clip/headband.